Did you wake up this morning with an idea for something that you just know everyone will want? Have you ever looked at something, just a little differently, and then bang, you see a whole innovative approach that you know is better? Is there a problem that has annoyed you so much, that you are always thinking of a solution to fix it? Do you feel a little bit of pain every time you have to use a product that isn’t as good as the one you can see in your head? How do you get these ideas out of your head and into the hands of other people? The first obstacle is within the mind of the person with the idea, you. It will take initiative, energy, and perseverance to convert an idea into a product. The stuff that we buy every day is the result of someone making it possible for those products to be made and sold. If you have something better, you have to put in the effort to get that item made and available for sale. That doesn’t mean it is impossible, it is completely possible, it just needs to start with determination. Once there is a determination to get your idea out of your head, there are a number of options and resources available to assist you on the journey. In this post, I want to talk about the people side of going from idea to product. It will be people, assisted by tools, that convert an idea into a product, so how do you get people to help you along the way? Here are some of the options. One of the most typical options is to figure out how to DIY (do it yourself) the product. You can dive into Google and YouTube to find out as much as you can about the subject. Find free or inexpensive design tools and then teach yourself how to use them. Maybe you have experience or are an expert in the product that you want to make. The lure of DIY is simple, you don’t have to pay for you own labor, and you know exactly what you want the product to be. There are a number of downsides to being a one-person operation. The biggest downside is the isolation of your idea from other people. To be received well, your idea needs feedback from others. Having to explain your ideas to others to get their help will make the idea better. Others will see things you don’t and that will make the product better, meaning more likely to be purchased. The other downside to you doing all the work is that you are the only one that will push this project along. If you are busy dealing with the details, you are unlikely to be steering the ship. Unless you get someone else to take on that responsibility, you have to make that responsibility the most important for you. Once you realize you can’t do it all by yourself, the next logical step is to get friends and family involved. Conversations will turn to “Do you know someone that can-do CAD?” or “Do you know any engineers?” Having a friend or family that can help is a great resource especially if they can be trusted. You will know what you are getting, and they can often be convinced to help out without exchanging money. You will need to think about how they are compensated eventually. You will also need to consider how qualified they are for what needs to be done and how much time they can actually put into your product. From my experience, this arrangement ends up with one of two outcomes. Outcome 1 is that you have a friend or family member that is completely dedicated to making this happen and turns into a full partner in the business. Outcome 2 is that the friend or family member loses interest in the project and slowly provides less and less effort. Typically, outcome 2 happens more frequently than #1. Recommendations are to communicated frequently about interest levels in your project and don’t push a friend past what they are willing to provide. Taking an approach with friend and family that they are more like “consultants” than employees will also make things easier until you are prepared to offer salaries. The next option is to hire independent contractors to do the work for you. This would be looking at the skills that are needed to move your product along and finding an expert for hire. There are a range of sources for finding these individuals at all different price levels and experience. Going to a local college to get students, with or without a professor’s guidance. Using FIver or other freelancing services online to advertise your needs. Most communities have a network of individuals that do provide these services and some people will moonlight on their day job to make a little extra money. With independent contractors “results will vary” with some being really good and other disappointing. If you don’t know what you need, then they will typically not help you overcome that problem and people who have a full-time job are typically show. Further, If you expect these people to work for equity or delayed compensation, you may find that your project loses priority. Considering all these options the most traditional way to turn your idea into a product is to hire a professional team. Hiring your own team puts you in the big leagues, but requires more than just cash, you have to now manage this team. With any team it takes more than just having talented people for the team to perform, the team has to perform well together. Going from a concept to an actual product requires thousands of tiny details be addressed. Big companies have well-established processes in place to make sure all those details are addressed and recorded. Part Numbers, Pricing, suppliers, packaging, return policies, color, surface finish, production signoff, etc. all need to be addressed and it is the technical team that bears most of those decisions. Take a group of great engineers and put them in a new company without any processes and their efforts will grind to a halt. If there is no release process for a drawing, then they can’t release the drawing. Sure it exists in the CAD software, but does it have proper dimensions? Are part number assigned to each part? Have design rules been followed (oh, you don’t have design rules)? This is why so many startups, funded by millions of dollars and really smart people are always late getting to market. They just underestimate how much work it is to set up the infrastructure to develop new products. Transcend Innovations is offering a new option to those wanting to turn their ideas into products. We offer a fully functional product team, complete will all the business processes needed to get the product development completed for the budding business to contract. Our processes are every bit as refined as what you would see in a fortune 100 corporation, just streamlined to reduce the bureaucratic overhead. By hiring a complete team, there is no learning curve for the team to overcome, they know how to work together. We pick out team members that love to develop new products, they are excited to be working on each product, for the challenge, the wonder and the anticipation of creating something new. Products made by people who love what they do are just better products. The best thing is, it typically costs less overall to hire a great team to do the job then to go through the cycle of DYI to friends to an independent professional to hiring your own staff. We can also get your product designed in a fraction of the team because we can afford to put a bigger team together than you would feel comfortable hiring. However, you go about getting the people in place to develop your product, think long term. In the end, you want to end up with a product that is making money. The better you do in developing the product, the greater your sales potential. Shortcuts taken during development end up to be very expensive once the product is in the market. Next, I’ll talk about the importance of requirements in turning ideas into products. 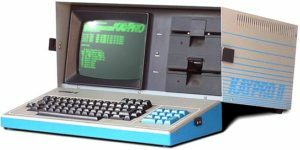 The first computer that I put my hands on was a Kaypro. My older brother got a job as a programmer and this was his instrument. It was a “portable” computer that was in a box that looked more like a sewing machine than a computer. The bottom of this “box” unlatched and revealed a keyboard and a CRT. It weighed a ton, ran CP/M and whatever programs you could fit onto a 256K floppy drive. Since that time the computer has evolved considerably. Computers got faster, memory increased, monitors turned color and communication became easier. Computers took over our desktops, filled our briefcases and then infiltrated our phones. There used to be Computer stores that you could go to buy a computer. Where do you go today? If there is a computer store in your town, I bet it feels more like an antique dealer than a sleek, modern, cutting-edge store. Computers seem more like office furniture than a vibrant display of the future. Why is the computer dying? At the heart of the “computer” is a piece of silicon where all the “processing” is done. It is called the microprocessor. It is a specialized electrical circuit that processes data extremely fast. Since the invention of the microchip, changes have been advancing the manufacturing of the microchip that double the capacity and cut the size in half about every two years. This phenomenon was observed and predicted by Gordon Moore in 1965 and is commonly called Moore’s law. This is the real culprit behind the changes in the computer. On the cutting edge, this has produced faster, more powerful processors that are much smaller and cost roughly the same as the previous generation. In its wake is an increasingly cheaper supply of relatively powerful processors. There are now microprocessors that could have run the Kaypro that cost less than a dollar today. Full, single board computers can be purchased for less than ten dollars. Moore’s law turned computers into a new commodity. Computers were designed to be very versatile. We could add new ways to interact with the programs running inside the computer. Computers have lots of connection points, ports, to add additional hardware. When the computer was expensive, it makes sense to provide lots of options to how to expand the computer. When the computer is cheap, it becomes much more sensible to just connect what is needed to the “computer”. That way you can have lots of computers for all the different kinds of stuff that you need to be done. Now the “computer” is “embedded” in whatever needs the processing. With the microprocessor, some power and a few ways to connect to the processor you have a tiny and cheap way to make anything run a program. While the computer of my childhood is quickly disappearing, computers aren’t dead. They very much are alive and multiplying all around us. Cheap, custom designed computers are all around us. If what you are holding has an “on” button and communicates with something else, chances are good, it is a computer. Our mission at Transcend Innovations is to turn concepts into products. We get you there.